*Originally published on July 20th, 2016. We first meet the boys playing Dungeons & Dragons in a basement. Later, we see a poster for John Carpenter’s The Thing tacked to a wall in a bedroom upstairs in the same house. A flashback sequence shows Will (Noah Schnapp) bonding with his older brother Jonathan (Charlie Heaton) over the music of The Clash, and we catch a poster for Sam Raimi’s The Evil Dead hanging on Jonathan’s bedroom wall. When their circumstances are imposed upon with undeniable supernatural influence, the group of social outcasts return to their D&D texts for guidance and understanding. Typically, it’s considered something of an authorial faux pas to directly name your story’s influences from within the story itself. Even when the inspiration is most blatantly framed, the most unapologetically derivative artists will try to avoid this. And certainly, Stranger Things show creators and brothers Matt and Ross Duffer were, in tone and approach, conveying their respect and indebtedness to the best of early 1980s adventure storytelling without hanging it on the set walls and etching it into their characters’ dialogue. When a group of school bullies corner the four to-be heroes and single out Dustin (Gaten Matarazzo) for his missing teeth, I instinctively expected to see the Truffle Shuffle. And when Mike (Finn Wolfhard) first takes the back of the bicycle parade with his new enigmatic and telekinetic friend Eleven (Millie Bobby Brown) riding shotgun on the banana seat, I spent the whole episode waiting to see their pedaling silhouettes fly across the moon. 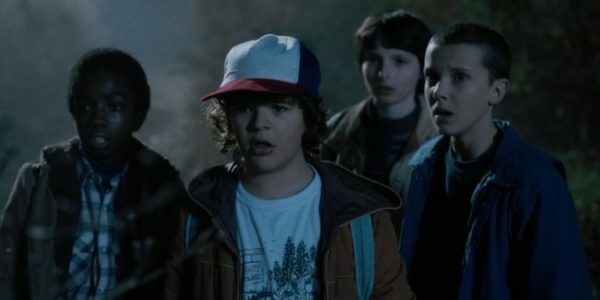 It seems early TV critics wrote about Stranger Thing’s nostalgic storytelling fabric based on screeners of the first three episodes of the first season, and their essentially unanimous distinction of its Spielbergian spirit is the only obvious place to begin any assessment of the show. Not only does the story build from the same archived blueprint applied in less successful attempts by J.J. Abrams in 2009’s Super 8 and this year by Spielberg himself with The BFG, it also sets itself in that peak-Spielberg era in 1984, two years after the release of E.T., and a few years before Gremlins and The Goonies, the three films from which the first half of Stranger Things borrows most freely without flashing the smuggled labels. 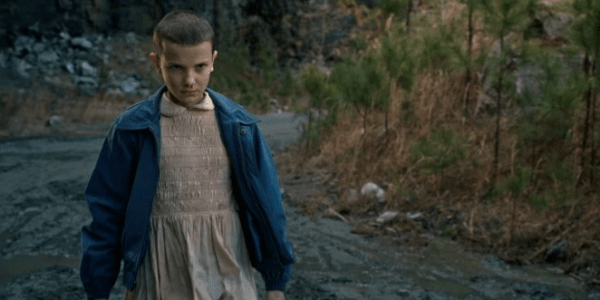 To understand why the Duffer Brothers might have chosen to distinctly present the posters and names of some of their influences, it’s useful to consider the two major differences between the show and the 1980s films to which it owes the most. The first notable separation is a statement of observable fact. E.T., Gremlins, The Goonies were all movies whose stories were contemporary to their current cultural context; they could not self-or-cross-reference because it would take years for each to establish the exact value of its own cultural currency. Just as, if one were to begin production on a film tomorrow with a script set in 2016, it would be impossible to predict which contemporary films, music, and media have the certain guaranteed timelessness to ensure that the film doesn’t age poorly with its artifacts. But today, to properly frame this central band of misfits as a product of that former era, the cleanest characterization method and, in this case, the most thematically purposeful is to decorate them with the most recognizable nerd artifacts of that era. The second distinction is that of narrative focus. All of the films listed in comparison center upon a singular adventure set upon by a group of young outcasts who along the way meet other exceptional characters (human and non-human, but always with a youthful innocence). That formula is true in Stranger Things, but only to a point. Mike, Will, Lucas (Caleb McLaughlin), Dustin, and Eleven, in the space allotted by the eight-episode format, grow into one of the most realized adventure character collectives in screen storytelling. They are endearing, hilarious, and fun. As the original consumers of 1980s adventure media, my generation recognized and related to these kinds of characters then. As the grown consumers of 1980s adventure media-homage Stranger Things, we only remember them now. We do, however, recognize and relate to other characters here, adults and late teens who those other films never would have presented in such complex terms. Where earlier adventure films focus almost exclusively on the children and have them step around stock siblings, absentee parents, and obstructive non-family adults, Stranger Things spends about one-third of its time and sympathy with the kids and splits the rest between Nancy Wheeler (Natalia Dyer) and Jonathan Byers, two teenage siblings of the boys in the original geek clique, and Joyce Byers (Winona Ryder) and Police Chief Jim Hopper (David Harbour), two parents coming to terms with the loss of a child, albeit each through much different vocabulary. The inclusion, attention, and empathy for these maturer characters permits the story to pull a jarring twist without revealing the gears of its pivoting. In the show’s fifth episode, The Flea and the Acrobat, the boys’ nerd-mentor and teacher Mr. Clarke (Randall P. Havens) explains a theory of multiple dimensions with a metaphor about a flea and an acrobat on a tight rope– the flea can crawl freely on either side of the rope while the human acrobat is limited to one side unless a large energy source creates a bend in the plane and punches a door through the dimensions. This snippet of theoretical physics is meant as literal exposition for the rest of the show’s events, but can symbolically and seamlessly be applied in other ways. Namely, this same segment also marks a transition from the reality of one legendary Steve to another. I can not think of any story—written, visual, or otherwise—that has ever incorporated trademark elements of both Steven Spielberg and Stephen King as successfully as this, but The Duffers may have proven here that the secret formula is to cleanly switch instead of intertwine the two. The two legendary storytellers may share chronological proximity and largeness of status, but both have distinctly different storytelling goals and approaches. Where Spielberg, at his best, is concerned with erasing the limits of creative imagination, Stephen King is more frequently concerned with measuring the darkness within and beneath human existence. Right around the moment that a makeshift autopsy reveals a fake corpse in Stranger Things, The Duffers abandon the celebration of the first to emulate the latter. The transition is discrete, but hardly a sucker punch. Up to this point, The Duffers have unleashed two homages: designing their title font as an off-brand replica of that often seen on the front of King’s novels and naming the transitional fourth episode The Body as a tribute to the famous King short story of the same name (which inspired the classic film Stand by Me, another movie to which Stranger Things owes debt). An episode later, the show once again directly names its influence when a character who offers an important piece of the puzzle clarifies a gap in understanding by asking if Joyce and Jim have ever read Stephen King. The hint is likely more helpful to viewer analysis than character information. Dimensional realities are a cornerstone in Stephen King’s fictional universe. From Derry to Castle Rock, Mid-world to All-World, almost all of King’s keystone works offer layered realities. King might populate these dark dimensions alternatively with insidious clowns, men in black, and more unspeakable creatures, but he always paints them in the same tone—the colorlessness of mortality and the gray shadow of death and dying. Most recently, King’s novel Revival presented a climactic look at what I think is his most nightmarish vision of a dimensional breakthrough when his protagonist interrupts the human barrier and peers into a reality of terrifying and eternal damnation of all human life. So if Stranger Things’ Upside Down world feels blatantly familiar, that connection should be observed as a design. And it’s just as necessary to observe each characters’ reaction to this borrowed metaphor of despairing mortality. When Nancy and Jonathan walk through the woods to hunt for what they know to be a dangerous monster, they speak in fear, but not of anything supernatural. Rather, Nancy and Jonathan are afraid of a life lived normally, of being as empty as everyone else in their small town by working a boring job, loving the wrong person, and living at the end of a cul-de-sac. Their vision of hopelessness is informed by Jonathan’s irresponsible father, his abandoned and desperately strong mother, and Nancy’s loveless parents. Joyce and Jim march without fear or second thought directly into that soulless otherworld, the loss of their children having rendered their here-and-now lives much more empty and frightening than any other possibility. And, most telling, the youngest characters stand and fight courageously when they are able to think of the Upside Down in terms provided by their popular culture. They bravely confront the occupying monster– “the bad,” as Eleven refers to it– whenever they can lend to it the label “Demogorgon” from Dungeons & Dragons. They actively seek out the secret world by comparing it to D&D’s Vale of Shadows. Every sticky situation seems to be resolved by a game-informed strategy or a movie reference. The resolution to the entire battle of good vs. soulless government wickedness and supernatural evil is resolved through the children’s love of their pop culture artifacts and by a character whose textual and meta-textual construction is borrowed from a number of countless, beloved stories. This, too, should should feel familiar to Stranger Things‘ most targeted audience. Netflix’s subscription-earned capital gives it a unique advantage in developing its own distribution model. This week, we might all be enamored with the company’s newest original series, but last week, most of us knew nothing of its production before the day-one endorsements of those early critics interrupted our social media feeds full of police executions, dark political carnivals, and general despair. Stranger Things wasn’t prepended with an unbearable bombardment of leaked set pictures and production rumors and viral marketing tie-ins. Nor was it bound by ties to existing properties or subject to the possessive, infantile, and poison brand of fandom that we saw ruin the release the Ghostbusters reboot the same week as Stranger Things’ Netflix premiere. It is a thing that just appeared, with so much creative nostalgic energy in its front-end that it distorted the compasses of lifelong nerds who have lived in lack of this degree of unexpected screen magic for a couple of decades. And, while the story offers enough charm to please anyone, it is these individuals who will be most warmly receptive of and emotionally affected by The Duffer Brothers’ clever time capsule, even if it’s overstuffed with trinkets. The first fans of Spielberg’s geek-culture-defining films are now in their 30s, 40s, and 50s now. Most of us have long ago had the safety bubbles of our nerd consumption punctured if not burst. Some of us lost friends or family way too early in our journey into adulthood. Some of us have unfairly lost our own children. Some of us have experienced divorce, career failure. Some of us have even accepted the compromised mundane future of Jonathan’s nightmare, living in cul-de-sac neighborhoods and working office jobs (It’s not as bad as we thought). But by now, we all have lost and failed and compromised and come to learn that the loss doesn’t end. That loss is a part of this reality. So, yes, maybe we hold on to our nostalgic films and childish hobbies, but maybe that’s also why it feels so nice to have a show come along and explain why we do. Stranger Things is a show in possession of a biting cynicism to which it never fully surrenders but never defeats. It’s also a show of dark fantasy that doesn’t completely yield to the fantastic. Rather, in both content and execution, it is a show about the use of fantasy to defeat life’s cynicism, an escapist pop culture event about the previous decades of pop culture escapism. It is a celebration of the intense power of imagination in cinema and television, the gates provided by media culture that allow us to escape to the better side of the tight rope. But it is also a fearful confession of our muted constant awareness of the underside of everyday life–that dark place of loss, compromise, and mourning that we first observed as children, then fearfully approached as teenagers, and we continue to occupy now, in adulthood. The epilogue of the eighth and final episode (The Upside Down) offers the first broad lifestyle portraiture of the idyllic, working-to-middle class Hawkins community and its residence. It’s the kind of sequence one might typically expect to begin a 20th century period piece story. Except, here at the end of this film, the snapshot carries an uncomfortable sense that the conflict resolution has embedded within its subjects a constant nightmare. A strangely passive newspaper headline dismisses the town’s error. Nancy is on the couch holding hands with the wrong guy. Jim is still sadly seeking surrogate fatherhood to fill an unfillable hole in his spirit. The kids are playing Dungeons & Dragons and laughing. The Hawkins Police Department, the Byers family, and the Wheelers household are all celebrating the holidays with smiles. And a child whose dark journey revealed the existence of other-worldly monsters and a dimension of despair that sits atop our own, while no one wants to discuss either of those things any further, is excited to receive an Atari for Christmas. Another reference to a pop culture invention that might provide escape and a hiding place. We can forgive that, since we, as viewers, watch it all with hope that there might eventually come a second season of the same magic to help take us away from our own upside down.